A common (and totally random) problem with GM vehicles that have the Passlock / Passlock II anti-theft system is that the vehicle will suddenly refuse to start. The problem is a poorly designed GM Passlock anti-theft system that erroneously enters anti-theft mode and disables the fuel injectors. GM should be forced to recall this Passlock system — it is simply unacceptable to strand motorists because of an incompetent anti-theft system. 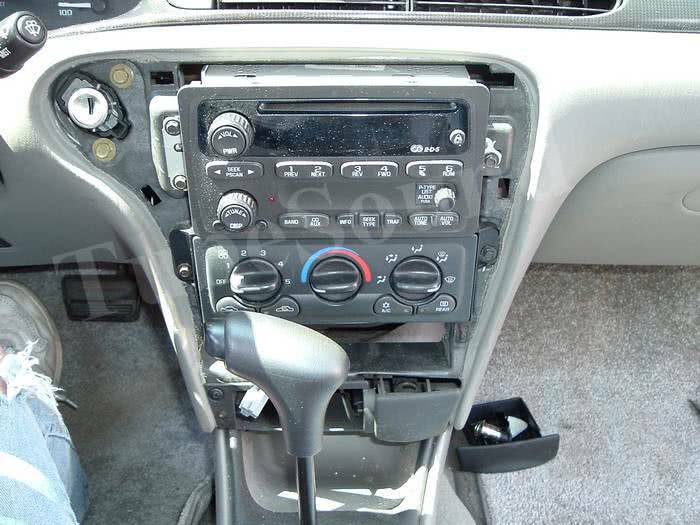 The vehicle in this example is a 2002 Chevy Malibu, but this Passlock system was employed in many GM models. Thousands of motorists have been stranded and left helpless by these GM vehicles that refuse to start for no apparent reason. The owner of this Malibu was stranded three times over the past two years, incurred 2 towing bills to a Chevy dealership, two “repair” bills from the incompetent Chevy dealer who obviously failed to solve the problem. Now she was stranded for a 3rd time. This time she called me. Roll down the driver window, remove ignition key, exit car. Reach thru the open window (do not open the door), insert ignition key, turn ignition switch to ON (not start, but ‘ON’, which is when the dashboard lights will come on. Leave key to ON position for at least 10 minutes (a few extra minutes to be sure). Observe the dashboard and make sure that the SECURITY lamp is not lit. If the security lamp is not lit, you can turn off the ignition key and remove it. Open driver door, get into vehicle, close driver door, fasten seat belt, start car and drive away. So that gets you going again, but this will not prevent the problem from happening again. A common sense approach is to disable the Passlock system. Of course this disables the anti-theft system, but last time I looked (1) you pay for insurance, which covers any unlikely auto theft, and (2) being stranded is a much more severe problem, and possibly life-threatening. Here is how I disabled the Passlock anti-theft system, and is not intended to be advice. It is an academic discussion to show how I disabled the Passlock system so that this motorist will NOT be stranded by Passlock defects in the future. remove small bezel around ignition key lock. It easily pops off with some gentle prying with a screwdriver. remove the bezel around the radio in the same manner. three screws remove the radio. Remove the radio as far as you can — no need to disconnect any wires going to the radio or antenna. 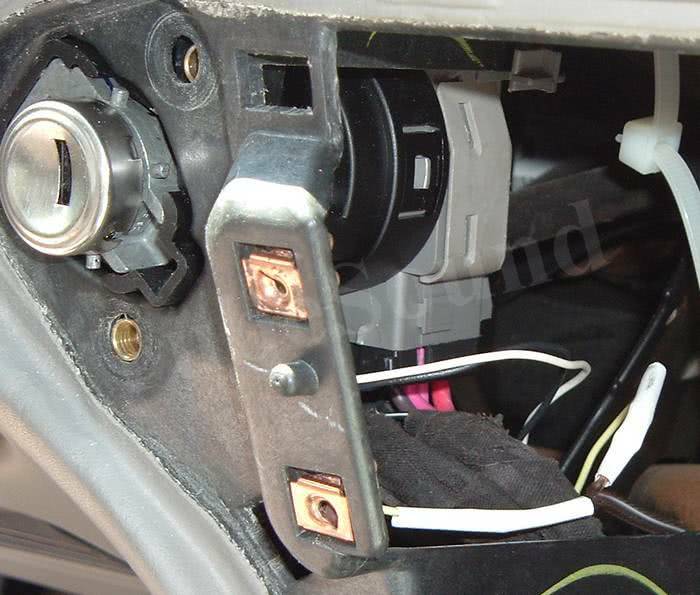 you can now see the ignition key area. The Passlock system is controlled by a group of three wires (black – white – yellow) connecting into the side of the ignition key lock. These are the only three wires in this group. 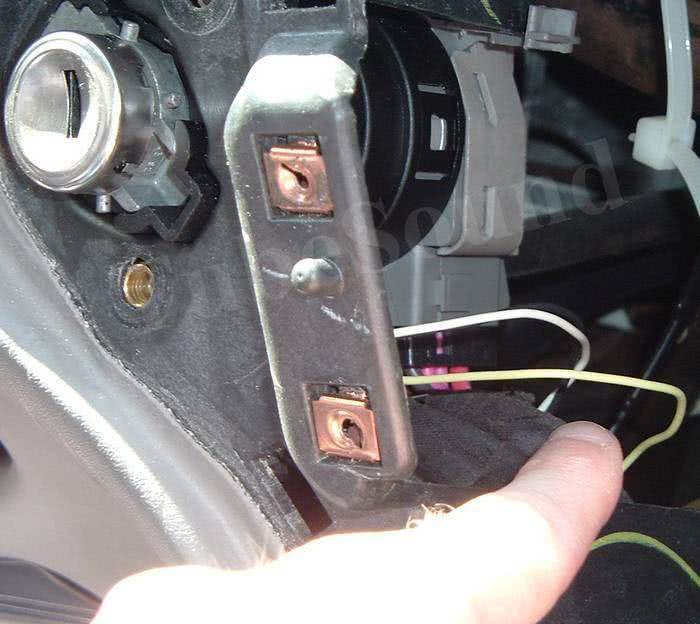 If you are looking at the large groups of wires at the rear of the ignition key, then you are looking at the wrong place. I cut the yellow Passlock wire in the middle, and installed a new toggle switch in series with this yellow wire. (If you need more room to work, remove the two screws that hold the ignition key lock.) Be sure to solder the connection and use heat shrink tubing to prevent any shorts. I ran approx 14 inches of wire to the toggle switch so that it could be mounted conveniently behind the console down behind the ashtray area. This switch will only be needed on a rare occasion, so it was mounted in a hidden — but easily accessible — area. Flip the toggle switch to the ON position, reassemble the radio and bezels, reconnect battery when done. Start car, wait 20 seconds, and while car is idling reach down and the flip the toggle switch to the OFF position. You will notice that the SECURITY light will now illuminate on the dashboard, and this simply tells the driver that the security system is now disabled. Yellow Passlock wire cut, and a toggle switch installed in series. The Passlock system will remain disabled until the battery is disconnected, or some other interruption to the electrical system would occur. Normally this would not happen until someone needed to change the battery, or disconnect the battery for some other repair. If that occurs, when the battery is reconnected, in order to start the car you must first flip your toggle switch to ON, and then repeat Step 8 above.